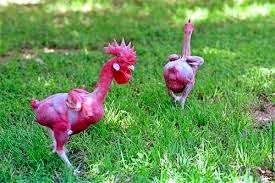 The featherless chicken is a unique breed of chicken, created by a team of researchers, led by Avigdor Cahaner, at the genetics faculty of the Rehovot Agronomy Institute near Tel Aviv, Israel. They are ecofriendly, since the procedure of plucking contaminates large quantities of water with feathers and fats. This is not the case with the featherless chicken. When pairing, the rooster may injure the hen with its nails and beak, as the hen has no feathers to protect itself. To prevent this, the nails of two of the rooster's fingers have to be cut off. There are many opponents of the featherless chicken, considering it to be a prime result of "bad" science, solely created to benefit our consumption needs. What's your opinion on the matter? Belgian Blue: The bovine version of Arnold Schwarzenegger ! That's sick! This is barf worthy!!!!!!!!! In fact, BLAGHHHH! I did not know this existed! I want some naked chickens. They are cute.